Ashburnham Triangle Association: Cruise liners: diesel generators or electricity from shore? Cruise liners: diesel generators or electricity from shore? 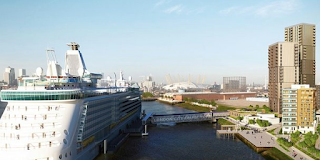 Should large cruise liners be allowed to emit nitrogen oxide from their diesel engines while docked at Enderby Wharf in Greenwich? Last week the House of Commons cross-party Environment Select Committee (ESC) said not, but the High Court has yet to rule on the matter. Enderby will have the capacity to handle 12-deck high ships. Developers are talking of 9- or 10-deckers, about 55 a year, spending typically three days each in Greenwich. These ships are slightly smaller than the Titanic (about 240 metres long, carrying up to 2,200 people). A ship this size burns 700 litres of diesel each hour round the clock, the equivalent of 688 heavy lorries. Numbers add up to over two-and-a-half million litres of burnt diesel per year at Enderby. One likely result of this is that London won’t meet its EU legal limits for nitrogen oxide emissions. This is true of Greenwich now, without the liners. One certain result would be a deterioration of Greenwich air quality, with attendant health risks. Emissions aside, London tourism will receive a large boost from the liners’ presence, with a fast clipper shuttling passengers to the West End in 20 minutes.